My friends and family were good to me this Christmas and, naturally, many of the exciting gifts I received were candy. Of all the various treats I was given, I was most intrigued by a tin from Peet’s. I’d never heard of Peet’s before, and was ready for some good eatin’ from the looks of the high-quality packaging. 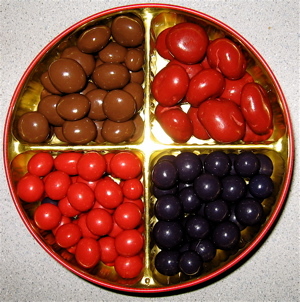 All four varieties in the one-pound tin looked and sounded tasty: Toffee Almond Crunch; Chocolate-Covered Cherries; Chocolate-Covered Blueberries; and Chocolate-Covered Cranberries. My only dilemma was deciding which candy to try first. I decided to start with the Milk Chocolate-Covered Blueberries first, and they were excellent. They had a strong, naturally sweet, intense flavor, and I could tell without question that the dried fruit inside the candy was a blueberry. I chose the cranberries next. I’ve never eaten Chocolate-Covered Cranberries before, and I expected them to be tart. Instead, they were a little too sweet, and the coating seemed distractingly waxy. I went for the Toffee Almond Crunch third. I like toffee, but the generous filling inside the Peet’s chocolate was too salty and left a funny aftertaste in my mouth. I didn’t detect much almond while I was chewing, but there was a definite hint of almond mixed in the strange aftertaste. I really didn’t like the Toffee Almond Crunch at all, but a friend who shared the candy thought it was delicious. I saved the Chocolate-Covered Cherries for last, mainly because they were so big and looked so good, and I wanted to make sure to end on a good note. They lived up to their looks. The dried fruit was very natural tasting, and the candy wasn’t too sweet or overwhelming. When I searched for Peet’s stores, a map of their locations popped up and showed that they’re dotted sparingly across the U.S., and none are near me. The company clearly seems to focus on coffee – after all, their full name is Peet’s Coffee & Tea – but for a drink retailer, they make some pretty decent candy. My favorite chocolate-covered fruit is still far and away Marich’s Chocolate Strawberries, but the Peet’s gift was well-packaged and much appreciated. Alfred Peet recently died here in Oregon (in Ashland) in August of 2007. My family and friends gave me NO candy. None! I get the feeling that they don’t want to enable my addiction (CANTSTOP-NAAA: Candy Addicts Not Too Strict Though Often Particular – Not At All Anonymous). Can your family adopt me, please?! I did get some, ummm, interesting cookies, however, they were “interesting,” not good! Had to buy my own damn candy…but boy, I could totally go for those chocolate covered cherries and blueberries; I’ve had ‘em before…mmmm!